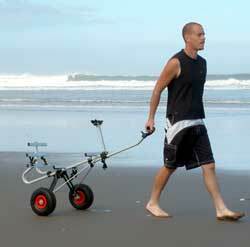 Save $50.00 On Our Popular Aluminum Beach Carts. I have just read your latest Kite Report and I too was fishing the Three Kings Islands during the same week. Pete Lamb from Wellington. organized the charter with Rick Pollick aboard "Pursuit" and he also supplied a lot of the specialist tackle. This 37kg kingfish gave the gear, and me, a good workout on the 130lb breaking strain Cortland Spectron I was using. The fish had 'blown' so it became one of only two kingfish taken. Another 20 or so kingfish were tagged and released over the four day trip. I tried to hook a bass on a ledger rig armed with 5/0 target hooks but sadly couldn't manage a strike. Pete is going to put the photo forward for the cover shot of the "New Zealand Fishing News". Ed : It certainly is a great pic of a huge kingfish and I really hope it makes it on to the cover. Paul has consistently submitted a series of excellent photos from his fishing expeditions and great catches over the years. We fished about 10 kilometers north of Bayleys Beach, Dargaville on the Saturday of Queens Birthday weekend. The wind was strong, the conditions perfect and the results great. We put two sets of 20 hooks out for about 50 minutes each from about 2pm to 5pm. There was a snag 20 metres in front of us just below the surf. I waded in to unsnag it - it was just a lone rock about half a metre high - but it was extremely dangerous because, as I approached the rock, there was a deep hole around it - I lost my footing and went under. Fortunately I managed to pull myself out with the the kite line. If this happens again I will either be cutting the line or waiting for the tide to go out! I did get it unsnagged though, and after re-baiting and moving a bit further down the beach we were kite fishing! 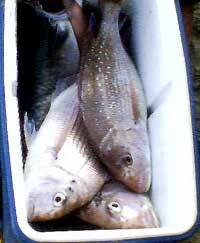 From the two sets we caught good snapper - two at 6kg, two at 4kg and one at 2kg. We also a caught a 30cm one, which we released, and the biggest kahawai I have ever seen - it was 60cm long. The second set came back with the last eight traces bitten off and a bit tangled so we decided it was time to leave. It was a beautiful sunset as we drove back along the beach although we were really disappointed to find that the kontiki fisherman, who were fishing maybe 200 metres down the beach from us, had caught a 5ft shark and had just left it sitting on the beach. They had left 30 minutes before us but the sixgill shark was still very alive when we got to it. We managed to get it back in the water, and it did eventually swim away, although it was very sluggish. Just leaving it sitting on the beach to die was completely unacceptable, especially since shark numbers are in a rapid decline. If your not gonna eat it, PUT IT BACK! There were four of us kite fishing, including two that had never done it before, they just loved it and are keen to come again! The photos are off a cell phone, so are pretty appalling. I think I need to invest in a digital camera. How lucky we are was very evident the morning of the 2nd of July. We hit the beach access at the golf course at dawn and drove 19.7 kilometers up the beach, this put us 2.7 kilometers north of Rimmer road. It was a stunning morning on a deserted beach. We spotted deer on the beach (briefly) and a very large sea lion lazing halfway up the sand. We had to wait until 8:15am until the wind arrived and we put out two sets with the mega mouth kite, one was set to 1000 meters out, the other to 750 metres. When the wind arrived it was moderate, the surf was slight and we used mullet for bait. Fishing over the incoming tide we caught one pan sized snapper, four kahawai and three good sized carrots (gurnard). The day was stunning. Unfortunately, we had to leave the beach early due to other obligations. On the way back down the beach the seal was still there, quietly sleeping above the high tide mark in the sun. Yes, the fishing was only average - but the experience, it was priceless! 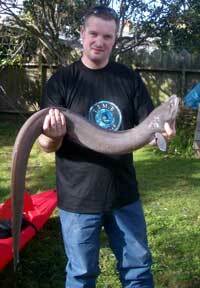 Attached are some photos of an eel which I caught a few days ago while using one of your small boat / kayak longlines. It weighed in at 6.1kg and was 130cm long! I would be very interested to hear from your experience how large this eel is in the scheme of things when compared with other eels that have been caught. The amazing thing was that I was long lining not far from the Devonport Wharf from my kayak and when pulling in the line, I felt very strong resistance. I was hoping for a nice juicy snapper but was amazed when this huge eel appeared beside the boat! After my initial shock I went about landing it. It proved impossible to get all of it into the kayak but thankfully, I had my "Snapper Stringer" with me. This is a small metal rod with additional line attached. I inserted the rod just below the eels head and pulled it through and out of the mouth while the eel was still struggling in the water. I had to stick a knife into the eel just behind the head to get the rod through. I then attached the cord on the snapper stringer to my kayak, so that even if the eel had broken the fishing line or the hook had pulled out, the eel would still be attached to the kayak. I still wasn't able to get it into the kayak despite several attempts and the help of a friend who was in another kayak. I finally decided to tow it alongside and headed in to the small beach beside Devonport Wharf. We got plenty of attention from amazed tourists and their frantically clicking cameras. I caught the eel on a kingfish rig, a 9/0 hook baited with a whole squid. All other traces on the longline were the standard 4/0 Target Snapper Hooks. Two traces had been bitten through or torn off, so of course I would have been interested to know what else may have been on the line. We fried and smoked the eel and it was delicious. Maybe not everyone's taste but all of us liked it. I was told the trick for cooking eel is not to use butter or fat, but to cook it in its own juices because it's quite a fatty fish anyway. I had a great day's kayaking, with the added bonus of a great dinner! Ed : Eels of this size are fairly common but they are seldom landed during daylight because the trace normally breaks before the eel can be pulled from it's hole. At night when they are away from their holes is usually when the biggest ones are taken. The biggest one I have caught was taken on a night set of a commercial longline at Simpsons Rock. It wasn't mush longer than the one above but was probably twice the weight, it had a huge girth. I have seen even bigger ones while diving around the Waiheke Passage from Ponui Island to Tarakihi Rock. I even got bitten by one in this area, it was sharing a hole with a crayfish I was trying to catch. After having read about kite fishing for years in the fishing magazines I decided to stop thinking about it and start doing it about 12 months ago, now I can't get enough of it. It's been awesome fun and I have no regrets despite the learning curve and the expense that sometimes accompanies the learning. I live on the central plateau so have to travel some distance to fish. Mokau has become my first choice, only two and a half hours drive away and excellent fishing. I have also met some really nice, friendly people, in particular Geoff Preston and Heidi and of course Geoff the carpenter. All passionate kite fishers. Anyway, what prompted me to put in a report is that I have been going through your report archive (again) and read again about beach etiquette, so thought I would have a go at doing a report of sorts. I did a trip to Mokau the weekend of Friday 2nd June arriving shortly before dark and went straight to the Awakino river mouth. The wind was almost nonexistent so thought I would try my recently acquired large inflatable kite which worked brilliantly, pulling 10 traces of salted bonito. As it was dark I only set it out about 300 meters out with the kite set on an angle directly out from the river mouth. After about 20 minutes the kite line felt so slack I thought the kite was in the water, so let it soak for another 10 minutes, then started retrieving it. After a short pull I found that the kite was in fact still airborne, but pulled it in anyway, only to find seven gurnard from 10 hooks. What a great start to the weekend! Early Saturday I set 11 baits of salted kahawai on my 65kg dropper rig under a power chute kite to about 700-800 meters offshore. I hauled it back after an hour, we caught four gurnard, one snapper and a kahawai. Then I moved camp for another set to the north of Sea View camp. The rig had been set about 20 minutes on an angle of approximately 70 degrees when two fisherman on a quad bike arrived with an electric kontiki each. They set up the first rig about 150m up the beach from me, it headed straight out and, as my rig was on an angle away from them , I didn't worry about it. However they then went the same distance below me and did the same thing with the other rig. I watched this one through binoculars and realized it was going to end up under my kite line. Panic stations! I carried out the fastest retrieval ever by hand, I am sure of that. Fortunately they saw what was going on and held their torpedo back. The consequences of fishing so close could have been hugely expensive for all, and totally avoidable with a little common sense. I calmly packed up, without saying to much at all, and moved to Seaview camp and put out another set only to snag on what is apparently a cray pot, I lost a hook section and the 30 metre leader line. Sunday morning was pretty rough so I put my flexiwing rig out to about 500 meters hoping for gurnard. The wind changed to the south after 20 minutes or so and the kite came to the beach on its own bringing one foul hooked gurnard with it. Time to head home. The wind is looking good for next weekend 24th/25th June so hope to go back then. Better luck next time maybe. A little etiquette goes a long way on a long beach, all that is required is a little thought about others using the beach.